In ten years, one of the most spectacular cathedrals on Earth will be completed, 143 years after its architect envisioned it. With one of its towers stretching 564 feet toward the heavens, the Basilica de la Sagrada Familia in Barcelona, Spain, will be the tallest religious structure in Europe. But it isn't only its size that makes the basilica amazing. Inside, the uppermost reaches of its pillars branch out like tree limbs to support the vast ceiling above. On that ceiling, star-shaped cutouts have natural light shining through them. Stained glass windows dapple the walls with a shifting pattern of colors throughout the day. And everywhere, there are carvings telling the entire history of the Catholic Church. Architect Antoni Gaudi began working on his grand idea in 1883. His design was so complex that instead of drawing it, he made detailed clay models. He knew it would never be completed during his lifetime. Indeed, he died in 1926 with a small fraction of the project done. Then in the 1930s, some of the partially completed basilica was destroyed in the Spanish Civil War along with many of the clay "blueprints." Workers painstakingly reconstructed them from the fragments and work resumed. But it wasn't until 2010 that the main cathedral was dedicated with a Mass officiated by Pope Benedict. Today, 3-D computer modeling has greatly accelerated the process of faithfully fulfilling Gaudi's dream. 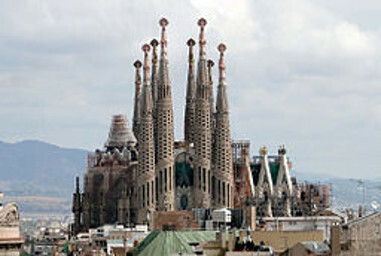 The goal is to complete the basilica by 2026, the 100th anniversary of Antoni Gaudi's death. To LEARN MORE, click on the links below. The first video is a fascinating animation of the construction still to come, while the first two minutes of the second video feature stunning views inside the cathedral.